My favorite thing about chilly weather is getting to wear cute and cozy accessories and this fuzzy hat is perfect! 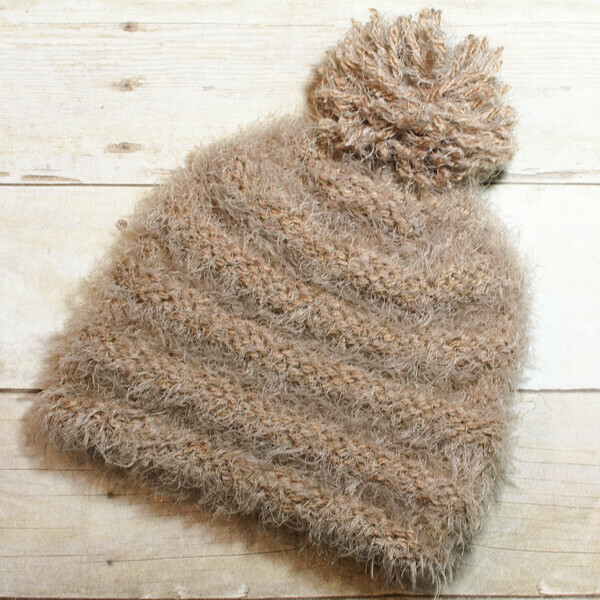 Hope you enjoy this quick and easy knit hat pattern. Pattern is for a standard adult size. Cast on 56 stitches (I used the long tail cast on) and join to start working in the round. Rows 1 through 6: Purl. Rows 7 through 12: Knit. Rows 13 through 60: Repeat Rows 1 through 12 four more times. Row 62: *Purl 2 together, purl 5, repeat from * — 48 sts. Row 64: *Purl 2 together, purl 4, repeat from * — 40 sts. Row 66: *Purl 2 together, purl 3, repeat from * — 32 sts. Row 68: *Knit 2 together, knit 2, repeat from * — 24 sts. Row 70: *Knit 2 together, knit 1, repeat from * — 16 sts. Row 72: Knit 2 together around — 8 sts. Cut yarn leaving a long tail and weave tail through remaining stitches. Pull gently to close up hole and weave in ends. Add a pom pom if desired. What yarn did you use for this hat? How do you get the fuzzy effect? ?